PathPointers is a new type of blog post that will highlight important everyday teaching points when reviewing kidney histology. These blog posts will be brief and easy-to-read, using real clinical images to demonstrate various biopsy findings. In addition to AJKD Social Media Editor, Timothy Yau, and Education Editor, Stanley Goldfarb, these posts are also reviewed and edited by Pathology Editor, Matt Palmer. 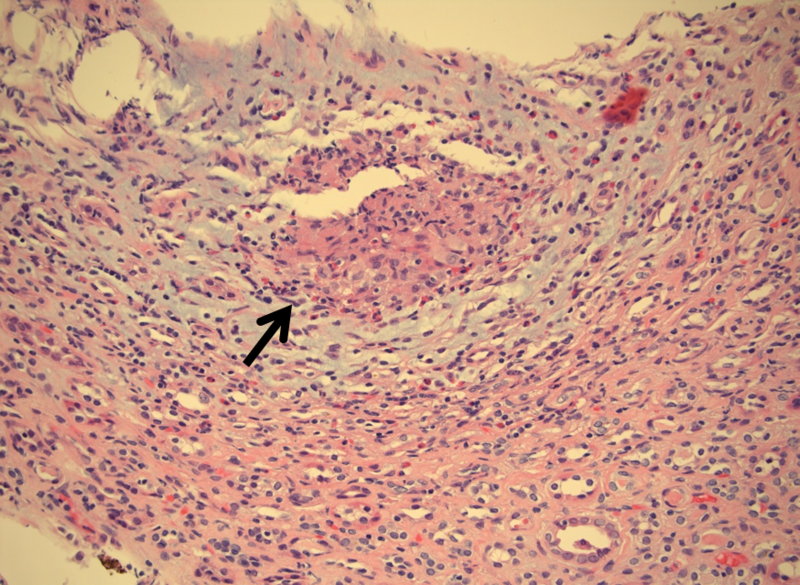 A granuloma is an aggregate of histiocytes, sometimes with multinucleated giant cells or necrosis. Granulomatous inflammation is a feature of certain disease processes, such as reaction to foreign material or crystals, certain infections (TB, fungus), or autoimmune disease (sarcoidosis, Crohn’s disease). 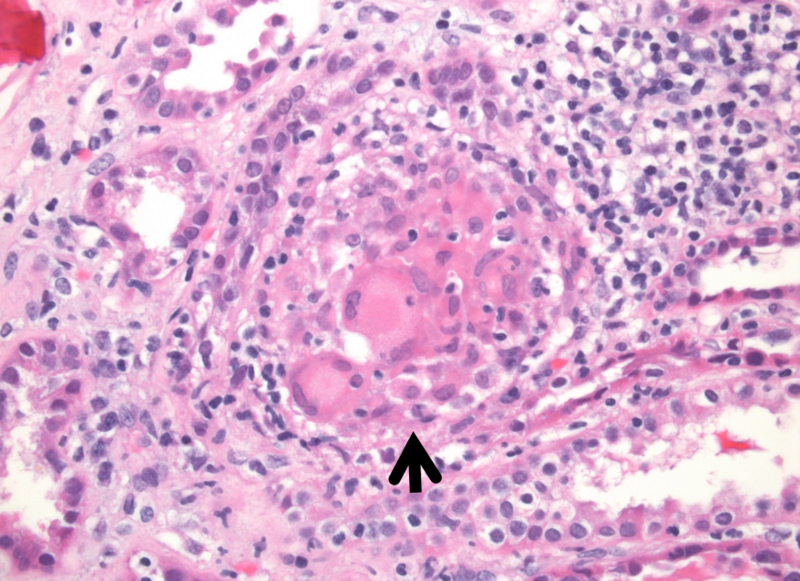 The images below show granulomas (arrow) with associated interstitial inflammation in kidney biopsies of 2 patients with Crohn’s disease and acute renal failure. Note the aggregation of epithelioid cells, with surrounding scattered lymphocytes, plasma cells, and eosinophils. Crohn’s disease typically involves granulomatous inflammation of the gastrointestinal tract. Extra-intestinal involvement by Crohn’s disease is rare, but a few cases of granulomatous inflammation of the kidney in patients with Crohn’s have been reported. A possible mechanism is cross-reactivity of T-cells primed against gastrointestinal mucosa with antigens in the kidney. Other more common possibilities of granulomatous interstitial nephritis in such patients should be excluded, particularly a drug hypersensitivity reaction. – Post prepared by Matt Palmer, AJKD Pathology Editor. Adenovirus can also cause granulomatous inflammation, and can be diagnosed by immunostaining for the virus.